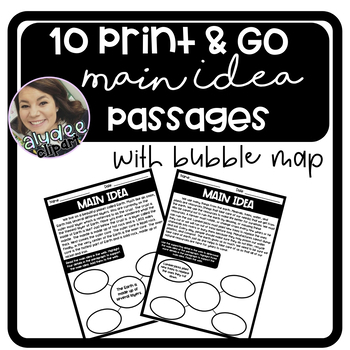 This product includes 10 print and go Main Idea passages with a Bubble Map. - 5 passages the main idea is provided and students must provide the supporting details. - 5 passages one supporting detail is provided. Students need to determine the main idea and provide 3 more supporting details. Great to use as an assessment, quick check in, or daily practice!